There are 7 Memory Care Facilities in the Milford area, with 1 in Milford and 6 nearby. The average cost of memory care in Milford is $4,800 per month. This is higher than the national median of $4,650. Cheaper nearby regions include Woodbridge with an average starting cost of $4,762. To help you with your search, browse the 6 reviews below for memory care facilities in Milford. Better rated regions include Stratford with an average rating of 3.0 out of 5 stars. Caring.com has helped thousands of families find high-quality senior care. To speak with one of our Family Advisors about memory care options and costs in Milford, call (855) 863-8283. There are currently around 75,00 seniors across the state of Connecticut who have Alzheimer's disease. As a city of close to 53,000 with 18.1 percent of its population aged 65 and older, Milford, like many other Connecticut towns, is seeing a growing demand for specialized care to serve those with dementia. While there is only one memory care facility in the town at present, 10 more of these facilities, known in Connecticut as Alzheimer's Care Units (SCUs), are available in nearby communities. Milford is home to world-class medical facilities, including those specializing in brain health and dementia care, such as Milford Hospital, in the event of medical emergencies or illness. At a score of 128.5, the cost of living in Milford is higher than both the Connecticut average of 118 and the U.S. national average of 100. The largest contributing factors in this difference are high housing and utility costs. This may influence where seniors and their families allocate funds when budgeting for a memory care facility. While winters can get cold, they are often much milder in Milford than they are in many other Connecticut towns. The winter low is 22 degrees, compared to an average of 17 degrees across that state. An average 204 sunny days are expected each year, and the area receives an overall comfort index score of 44 out of 100. However, 31 inches of snowfall is likely during the winter months, so it's worthwhile to inquire as to what measures an SCU takes to ensure the safety of its residents when these conditions arise. Despite low crimes rates across the state, Milford sees an influx in this area. In terms of violent crime, Milford scores a 34.6 out of 100, with 100 being high crime. Property crime is also quite high at 33.4. Most facilities will have safety and surveillance equipment in place, but it's a good idea to review a facility's security policies and procedures. Memory Care costs in Milford start around $4,800 per month on average, which is on par with the average cost of memory care is $4,800 per month. It’s important to note that memory care rates in Milford and the surrounding suburbs can vary widely based on factors such as location, the level of care needed, apartment size and the types of amenities offered at each community. To see a list of free memory care resources in Milford, please visit our Assisted Living in Connecticut page. 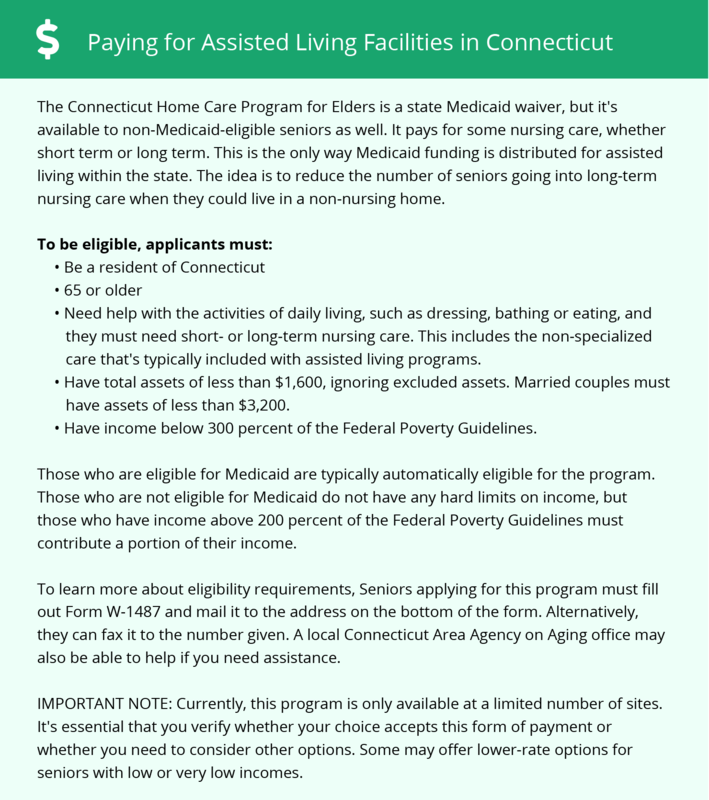 Milford-area assisted living communities must adhere to the comprehensive set of state laws and regulations that all assisted living communities in Connecticut are required to follow. Visit our Memory Care in Connecticut page for more information about these laws.